By MIKE CHAIKEN EDITIONS EDITOR When renowned artist Andy Warhol’s name pops up, many times thoughts will turn to his famous day-glo screen prints of Marilyn Monroe and Elizabeth Taylor. But, typically, you don’t think of cats and dogs or pencil sketches. But the new exhibit at the Mattatuck Museum offers up a new dimension to the famous pop artist. “Love, Andy: Highlights from the Andy Warhol Museum” is now open at the museum in downtown Waterbury. 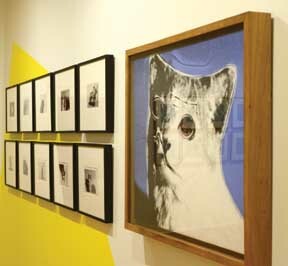 The show features a selection of the artist’s screen prints of his friend’s pets done in the famous Warhol style. It also features sketches he created throughout his life, and a collection of photographs taken by other people of Warhol’s friends with their pets that the artist collected. “It’s really a sort of Valentine to Andy Warhol,” explained Bob Burns, the director of the Mattatuck. “He truly is a romantic person. 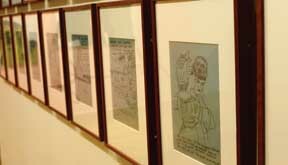 It’s a side of him you usually don’t see beyond the persona of the wig.” Burns said the exhibit in Waterbury consists of two loan shows from the Warhol museum in Pittsburgh. 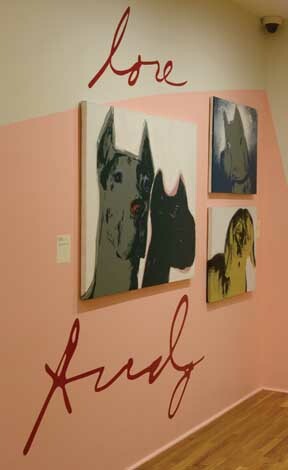 The collection of sketches and Valentines is one show, that’s “Love, Andy.” And the collection of paintings of the pets Warhol had known, dubbed “Canis Major: Andy Warhol’s Dogs and Cats,” is another. “We chose to put both of them together because when we were reading about the dogs and cats, there were all of these kind of comments about how Andy Warhol loved his pets probably more than anyone else,” said Burns. “He collected all of these photographs by other people of people and their pets. People he loved and animals he loved.” “It seemed to make sense … to put both of them together,” said Burns. “It will surprise people what they see here,” said Burns. “There’s something for everyone.” There are the screen prints, of course. Casual viewers of Warhol will “immediately recognize how his form with Marilyn Monroe and Elizabeth Taylor translates to these animals…. These silk screens of domestic pets… (were) treated in the exact same way he treated those movie stars.” But also, said Burns, “There is this one whole section of illustrations for a book called ‘The Pink Cake’… It’s a whole story and you can get this insight into his sense of humor… It opens up Andy Warhol a little more and makes him human because he was working so hard to be a façade.” Some of the sketches on exhibit also reach back to Warhol’s youth. “When he was a very young child, when he was 6, he became sick with something called St. Vitus Dance, and he was bed ridden. So his mother, to entertain him, taught him to draw, so they would draw together and that led to this lifelong love of drawing and illustrative cartooning,” said Burns. “He also was at the same time collecting magazines of Hollywood stars and cutting them out,” said Burns, “and creating these collages…This is seen in the rest of his work.” Burns said the Mattatuck opted to bring the Warhol exhibit to its walls as a way to broaden the experience of visitors and bringing in some variety to the institution. “When we did our strategic plan, we said we’re going to at least once a year do a bold-faced name exhibition.” “We have never stepped away from our dual mission of history and art,” said Burns, noting the permanent collection continues to focus on Connecticut art. But, he said, “We’re trying to attract a larger audience here so they can also enjoy the history exhibit on the first floor, which tells the amazing history of the Naugatuck Valley and our permanent exhibits as well.” And “Love, Andy” fits into that mission. “Anyone who likes Warhol at all in any shape or form will enjoy this show,” said Burns. “Love, Andy: Highlights from the Andy Warhol Museum” is on exhibit at the Mattatuck Museum, located on the green at 144 West Main St., Waterbury until Feb. 7. In connection with the exhibit, there will be an artmaking activity on Jan. 13 and a free admission day on Jan. 10 with a family art activity. The museum is open Tuesday through Saturday, 10 a.m. to 5 p.m., and Sunday, noon to 5 p.m. Convenient, free parking is located behind the museum in the lots on Park Place. For more information on all of the museum’s programs, events, and exhibits visit the website at mattatuckmuseum.org or call (203) 753-0381. Comments? Email mchaiken@BristolObserver. com.